The Volvo Towns, "home to east coast elites of the culture wars" , the affluent and educated, will probably go to Obama whom they are apt to view as the reform candidate. Towns of : Hanover, Concorde, Keene, Portsmouth, Brookline, Durham and Peterborough. The Metropolis, Less affluent and more moderate Dems, could go either way. City of Manchester. Lunch Pail Priorities: Blue collar, Berlin and Lyme and a few others. Beyond Currier and Ives: Off the beaten track, Walpole and Mason. Undeclared voters may declare a party and vote at any primary. The law allows an undeclared voter to declare a party at the polls, vote the ballot of that party, and then change their party affiliation back to undeclared simply by completing the form available from the Supervisors of the Checklist at the polling place. Congresswoman Sheila Jackson Lee of Houston, Texas also made a visit to Portsmouth Junior High School in support of her favorite candidate, Senator Hillary Clinton.“Hillary is a candidate of ideas. I’m excited about her candidacy because I’m excited about what she can do,” Jackson Lee said. The results of yesterday's CNN-WMUR New Hampshire poll have been updated to include additional telephone polling conducted yesterday (Sunday). Yesterday's numbers included all day Saturday polling and Sunday polling only from noon to 3 pm. The final numbers reflect the addition of the additional Sunday calls. The revised poll results are here (pdf). Only 53% of likely Democratic primary voters have firmly decided on their preferred candidate. 26% are leaning towards a candidate and 21% are undecided. 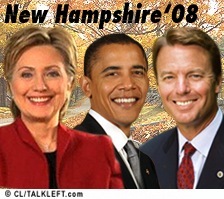 Among likely Democratic primary voters, the numbers are: Obama, 39%, Hillary 30%, Edwards, 16%. 60% of registered Independent voters will vote in the Democratic primary and 40% in the Republican. Bottom line: 16 hours before most polling places open in New Hampshire, 47% of those likely to vote in the Democratic primary have not made up their mind. Hillary Clinton's unique combination of smarts, experience and toughness makes her the best choice to win the November election and truly get things done. Before embarking on an agenda of her or his own, the next American president will be forced to undo the damage of the Bush years: ending the war in Iraq, restoring habeas corpus rights, ending the use of torture, healing New Orleans, restoring America's moral authority around the world..... The next president must also take the lead on a serious effort to slow global warming, a rational policy on illegal immigration and a plan to provide health care to all Americans. Clinton knows what she wants to accomplish. She knows how Washington works. She has forged alliances with unlikely political partners, and she has waged partisan fights on matters of principle. Her years as first lady and as a U.S. senator have put her at the center of key policy and political battles for a decade and a half. She is prepared for the job.